TopChinaTravel.com is the on-line tour operator operated by our professional sales team. We strongly believe the value of teamwork is the irreplaceable key to our success in fierce competition. All of our travel consultants team up to present you the most efficient quality service as well as a pleasing China tour experience. All of our travel consultants are all local Chinese, having lots of opportunities to travel to every corner of our country. Their first hand knowledge will benefit to design a more suitable China tour program for you. Most of our consultants are all travel professionals who dedicate in travel industry for more than 5 years. Their rich experience and thoughtfulness will guarantee you an unforgettable China experience. When you plan to travel to China, but have any question about your China tour, please do not hesitate to contact us by email or phone call. Our travel consultants will be pleased to deal with your requests and try to arrange a memorable trip for you. Furthermore, Welcome to visit us in Guilin! TCT office is located in Guilin, a small but beautiful city in Southern China. If you happen to have Guilin in your China tour plan, we warmly welcome you to visit our office, having a face-to-face talk with you, listening to your tour experience in China and your idea about this trip. You will find it also be a nice memory during your trip in China! Besides, our travel consultant will go to the hotel you are staying in Guilin to meet you if your tour itinerary is too tight to visit our office. As a pioneer and leading B2B wholesaler website for travel agents, Top China Travel aims at creating the fastest and most useful access to travel agents from all over the world to explore and expand their market to China! My team and I are always focusing on how to provide our partners and friends with the superior service. We are on the way. People learn in different ways. Some people learn by doing things, other people learn by reading about things. As a famous Chinese saying, traveling 10000 miles makes you more knowledgeable than reading 10000 books. And I as the Vice General Manager of TCT, choosed travel as both my career and my life style. As the Director and also the main founders of TCT, I had devoted my passion in TCT’s website designing and managing for over 10 years. There is no greater joy and honor for me to ensure that my team spares no effort in providing you the utmost travel guide and the most impressed experiences for your amazing China trip! As the Marketing Manager of TCT, identify needs of travellers and sense the trend of travel market is what I am professional at. Years after worked in this field, I have witnessed TCT growing up from its infancy to main marketing leaders with numerous great reviews marked on Trip Advisor on which it is also highly recommended. Lord Bacon once said in his classic article - Of Travel, “ Travel , in the younger sort, is a part of education; in the elder, a part of experience.” And I would say Top China Travel will do its utmost to bring you both abundant knowledge and tremendous experience when you're traveling in China. So why not join us? As a sales representative and tour enthusiasts, I will always be there to offer you great help! Life without friend is death without a witness, while traveling is a good way to make friends. Hence I love traveling. Don't you find that you are having less and less friends while you are focusing on your work? If so, come on, join us! We are Top China Travel, providing you a tailor-made tour to release yourself, enjoy marvelous scenery, experience different culture and custom and meet people. I am a person who loves traveling and making friends. Because traveling let me know so much knowledge of cultures, customs, geography etc. The most important thing is I can make many new friends thought traveling. My major is tourist English, so I am proud of being a member of TCT. Working as a sales representative is full of challenges, I still can be satisfied when I help people who are fond of travel to discuss about their China tour. Try to meet all requirements from you on travel facet makes me feel happy. Life is a journey with an unknown destination,which is the most attractive factor of travel.You will never know what happen next. Life full fills with surprise and adventure, so does travel. The tour is that raod of knowlege.So,I am Rebecca,who is always smiling and outgoing, take all your romantic and adventure spirit, and I will get the rest ready for your trip. Follow me, follow your heart, the world is at your feet. Hi, I’m Tina, a sales representative of Top China Travel. Traveling is one of my hobbies because it can enlarge my knowledge and can make friends with people around the world. What’s more, it can also give me a chance to enjoy the delicious food in different places. And I love sharing my travel experience and delicious food with others and I do believe that “the world will be more beautiful because of sharing” My biggest hope right now is to make every of my clients have an unforgettable travel experience in China. Traveling and reading are two important things in my life. As a Chinese old saying goes. Traveling ten thousands miles and reading ten thousands books is the top ideal for people. I believe that travel does broaden our mind. 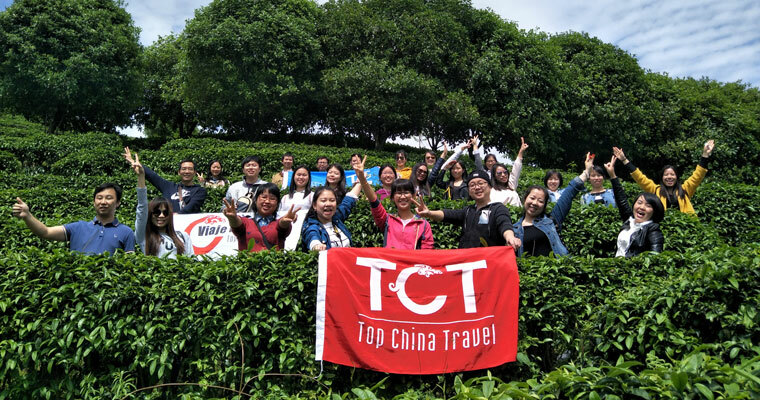 At TopChinaTravel, you will find the most efficient, thoughtful and friendly sales team. For your every trip in China, you deserve the best service like us. As a sales representative in TCT, i am honored to make an unforgettable trip for you. Travel makes one modest, you see what a tiny place you occupy in the world. Traveling has humbled me and has broadened my perspective in so many ways. I am very glad to work in Top China Travel and help you with your journey. Life is like a box of chocolate, we will never know what it tastes like until you open it and taste. Curiosity on the world activates me to learn more from life by travelling. No more need to emphasize the benefits of travelling, the emphasis is travelling with whom, cause this matters. Here we are for you with tremendous tour experience and professional knowledge. With Top China Travel, you will have a worry free China tour experience. And I am lucky to be one of this team serving you. Travel is a thing in our blood, follow it, you could track a brand-new you, or even open a new world. Have a trip when you are ready or not, I would like to reach my hand to you, and professional service from Topchinatravel will add touches to your travel. Together, we have a nice trip and an one-in-million tour experience. We always describe life as a journey without an exact destination. Why do we have to be on the road? Because the road is just there and you’ll never know how extraordinary the scenery will be until you walk on the road. We all deserve a journey to walk on. As long as we take the first step, we will be able to live a new life. The reason why people love to travel, not to reach the destinations, but to enjoy all kinds of fun during the journey. Only when one travels then could reads one's own mind, which tells one that the world is wider than imagines. I wish I could be the one who show you the best of the world.